During the first decade of the 1900s, there were three types of automobile competitions; road racing to evaluate speed and endurance, long-distance tours to determine durability and hill-climbs to measure strength and torque. This Sunday, the Village of Port Jefferson will be celebrating the 100th anniversary of one of the most famous Long Island hill climbs. The history of the Port Jefferson Hill Climb and the upcoming celebration was recently described in northshoreoflongisland.com. 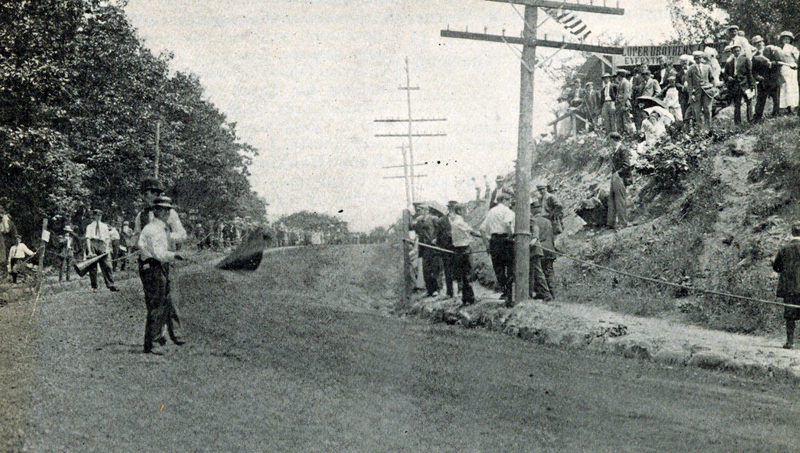 The 1910 Port Jefferson Hill Climb consisted on 67 cars competing in 16 different events (determined by car type, cost of the car and amateur or professional status of the driver). The feature event was the free-for-all won by Ralph DePalma in a 190 HP Fiat. DePalma climbed the 2,000 foot hill in 20.48 seconds. Caleb Bragg was second in a Fiat followed by Fred Belcher in a Knox. DePalma went on to win the 1912 and 1914 Vanderbilt Cup Races. Bragg and Belcher both competed in the 1910 Vanderbilt Cup Race. Another participant was the one-cylinder Only car manufactured in Port Jefferson (seen here). The Only, with "only" one cylinder, finished with the 10th best time. The July 2, 1910 issue of Automobile Topics provided a three-page summary of the event Port Jefferson Climb Has a Big Entry List. Come out to Port Jefferson on Sunday morning at 10:00 AM and see the Alco "Black Beast" and many other vintage cars climb the hill to honor Long Island's rich racing history.